CAS and the Centre for Non-racialism and Democracy (CANRAD) hold a ‘turning point’ catalytic conference on the ‘precolonial’, Nelson Mandela Metropolitan University, Port Elizabeth, 15-17 March 2017. CAS Honorary Associate Dr Fani Ncapayi presents on 'Methodologies used to investigate the lives of residents in villages of the former Xhalanga district'. Rest of panel from left to right: Professor Simphiwe Sesanti of UNISA (Chair); Mr Giyose of CALUSA, who spoke on 'The Story of the Qhumanco'; and Dr Nomathamsanqa Tisani, who spoke on 'Of Definitions and Naming'. A total of 80-odd delegates from various higher education institutions and community organisations participated in a ground-breaking three day intellectual conference on the ‘pre-colonial’. The conference was opened by Professor Andrew Leitch, NMMU Deputy Vice Chancellor: Research and Engagement. Professor Lungisile Ntsebeza delivered the welcome address as Conference Chair on ‘Whose History Counts?’. CAS Research Officer, Dr June Bam-Hutchison was the key organiser of the conference with CANRAD and presented two papers and chaired the opening panel. The conference attracted a diverse range of delegates including the local Khoi community organisation; Cala University Students Association (CALUSA) in the Chris Hani Municipality of the Eastern Cape; African Roots; the Red Location Museum; African Heritage; Robben Island; Ezingcanjini African Heritage; Khanyisa Trust; student bodies and also from afar, the National Institute of Arts and Culture of Mozambique. A number of South African universities and higher education institutions participated: NMMU (Sociology, Anthropology, History, Architecture, Archaeology, Palaeoscience, Education & Teacher Development, Music, Mathematics, Science etc. ); UCT (African Studies; the Archive and Public Culture Research Initiative’s Five Hundred Year Archive digital project; the Afro-Asia Catalytic Music Project); Fort Hare University (History), UNISA (Institute of African Renaissance Studies), University of Johannesburg (Pan African Institute), Rhodes University (African Language Studies), Stellenbosch University (Philosophy), University of the Western Cape (Anthropology and Sociology), and the University of the Free State (Institute for Reconciliation and Social Justice). The conference had a very practical focus on projects that exist on the ‘precolonial’ and included themes on decolonising education materials and the curriculum; teacher training and pedagogies; visual and digital epistemologies; poetry and performance; community-driven oral histories and methodologies; missing idioms in African historiography; contesting assumptions on gender; African feminist perspectives; time and challenges of the archive; the challenges presented by heritage sites; secrecy and ethics. Leading African Historian Professor Toyin Falola of the University of Texas at Austin participated in the conference and addressed the interdisciplinary gathering on the ‘ritual archive’ at the conference dinner on 15 March. The conference presented also an occasion for the launch of the recently published Tribing and Untribing the Archive, edited by Carolyn Hamilton and Nessa Leibhammer (2016, UKZN Press). A number of papers were presented over the three days, followed by in-depth discussion and at times heated debate on decolonisation, transformation and epistemologies. 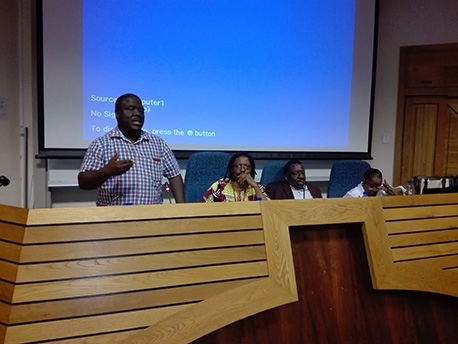 Three breakaway workshops were held on the last day on (1) ‘conceptualising the precolonial’ (led by Professor Nomalanga Mkhize, NMMU); (2) ‘precolonial methodologies’ led by CAS Honorary Research Associate and CALUSA’s Dr Fani Ncapayi; and (3) ‘precolonial strategic networks’ led by Professor Jeff Peires, Fort Hare. 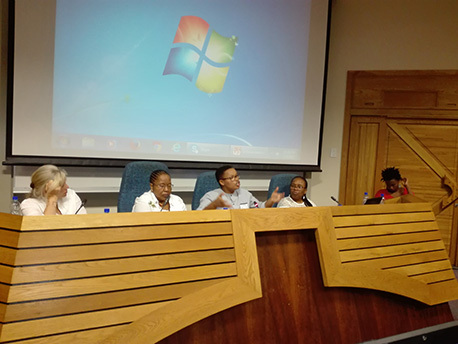 The conference was closed by NMMU’s Professor Denise Zinn, Deputy Vice Chancellor: Teaching and Learning who addressed the conference on the salient aspects of the deliberations of the conference and their implications for curriculum transformation. The conference was funded by the National Institute of Social Sciences and the Humanities (NIHSS). Dr Babalwa Magoqwana of NMMU presents on 'Repositioning uMakhulu as an Institution of Knowledge'. Rest of the panel from left to right: Professor Carolyn Hamilton (UCT) who spoke on 'Time and the challenges of the Archive'; Dr Nomathamsanqa Tisani (Chair); Professor Pamela Maseko (Rhodes) who spoke on 'isiXhosa does not do gender'; and Professor Nomalanga Mkhize (NMMU) who provoked thoughts on 'Rubusana and the Missing Idiom of African Historiography'.